Games & Tea: We're still at least 17% alive! We're still at least 17% alive! Well we can't really deny that Games & Tea has been quiet of late, so we figured an update was about due - this post is part apology, part explanation. A few months ago you may remember we posted a review of Pirates! Card Game, a Kickstarter project by Jules Prick. It was our utmost pleasure to see the project reach its funding goal, and knock through its stretch goals on the sprint to the finish line! We've mentioned in the past how when you ramp up your Kickstarter pledge you start to get jucier rewards, and one of the rewards for Pirates! was a pirate sloop tour around the canals of Amsterdam - the birthplace of the game. Always eager for a chance to dress as pirates and terrorise a European capital city, we jumped on board (see what we did there? ), and as things spiralled out of control it's ended up basically becoming a Games & Tea holiday! Unfortunately, holidays are expensive things, and as a result a large portion of the last few months has been dedicated to scraping together enough pennies to actually see this thing through (an £80 pledge has now turned into a £700 city break!). However, the funds are now raised, costumes bought, flights and accommodation booked, and some semblance of normality is starting to be restored! We're jetting off towards the end of September, so when we get back you can expect an in-depth report on our experience of a Kickstarter launch event, and tales of any other game-related shenanigans we manage to get up to while we're there! We're also hoping to get back to a decent reviewing rate fairly soon - one of the downsides to spending so much time raising holiday funds is that we've been unable to get together for fun game times. We're very eager to get reviews of Space Alert, Firefly: The Board Game, and Space Cadets: Dice Duel on the go, so please bear with us, we promise we're doing our best to restore our former glory! We figured we might as well end this article with a couple of impending releases which currently have us salivating! Free advertising is not what Games & Tea is about, so it's just a coincidence that these are both from Fantasy Flight. If you're one of those rare people in the world who have heard of the Star Wars franchise, this might just grab your interest. 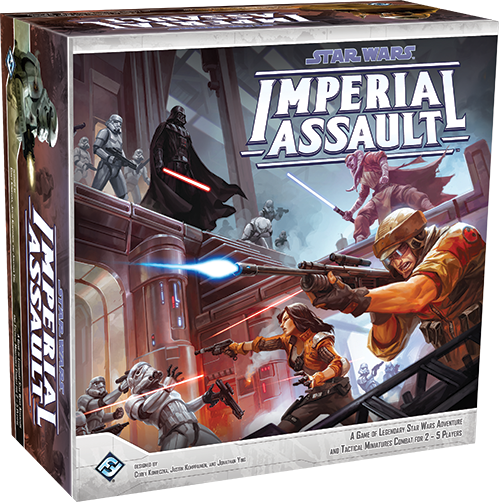 StarWars: Imperial Assault is a strategy board game set in between A New Hope and The Empire Strikes Back, immediately following on from the destruction of the first Death Star (yes, this means you get to play as non-robohand Luke). Fantasy Flight do seem to be fond of the "1 vs many" gaming style, and they've gone with this approach for Imperial Assault, with one player controlling the Imperial side whilst up to four other players assume the role of the Rebel Alliance. As you'd expect from Fantasy Flight, the game components look lavish, with no expense spared in production values. The thing which really caught our attention though is that as well as just setting up for a single game, there is a full narrative campaign of missions which players can enjoy as they watch an unfolding story. With 59 double-sided map tiles there should be no shortage of battlegrounds, so in theory this should be a game with a high replay value. Again, sticking with the Star Wars universe (Fantasy Flight do love making the most out of their licenses!) we have Star Wars: Armada. The X-Wing Miniatures Game took the world by storm upon its release last year (check out our review of it here), with demand for more ships far outstripping Fantasy Flight's supply. Whilst X-Wing did have a few mid-scaled ships such as The Millennium Falcon and Slave-I, the scale of the fighters made larger ships unfeasible, and even though many players were keen to see the release of Star Destroyers and other such capital ships, most knew it was an unrealistic hope. But Fantasy Flight are never ones to let down their fans and turn down a money-making opportunity in the process, and as a result we have Armada on the way! Unlike X-Wing, Armada operates on a much smaller scale. Whereas its predecessor gave players individual fighters to operate, Armada gives you squadrons of fighters which operate as one, and the mid-scaled ships are replaced by the Star Destroyers we all always wanted! It's not just a case of making everything smaller and keeping the rest of the system identical though - for on thing movement is very different, as players find themselves having to compensate for inertia when piloting such hulking masses around the gravity-free abyss of space. 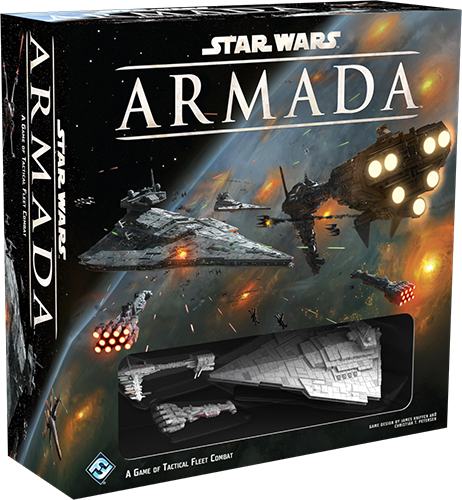 Due for release later this year, Armada does have us very excited, and we're certainly not the only ones hoping it lives up to the hype!